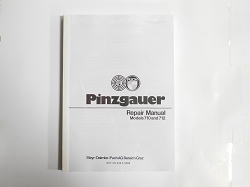 Complete parts manual with component breakdowns. Original copyrighted material, not a cheap stateside reproduction. We use these almost as often as the repair manual when working on trucks in the shop. This is the first thing you should buy once you get your hands on a Pinz. Exceptional exploded view diagrams of truck components.